When you're making a big purchase like a TV, you're going to shop around for the best price—but the lowest price tag isn't always the best buy. Though we may not think about it when we're price shopping, there are other important considerations, like returns, delivery, installation and service. What happens when you buy a TV and decide you don't like it? Returns can be a hassle—and even more so for a bulky item like a television. What if you want to wall-mount your TV—does your retailer offer easy installation options or will you have to have the DIY know-how to handle it yourself? Let's take a look at the most important things to consider while shopping to help you decide whether you should shop online or in store. Which has the best prices? You'll almost always find lower prices online than in-store—because it's so easy for shoppers to do cost comparisons with just a few keystrokes, low prices typically win the day online. However, apps have made it easy to do cost comparisons in-store, too. ShopSavvy can scan barcodes to do a quick online price search so you know whether you're getting a deal or a dud (at least price-wise)—or, if you don't want to leave the house, prices on the websites for Best Buy, Walmart and more are typically the same online and in-store. Amazon: Will match prices from Best Buy, BJ's Wholesale Club, Circuit City, Costco, Fry's Electronics, Kmart, LG, Newegg, Sam's Club, Samsung, Sears, Sony, Target and Walmart within 30 days of purchase. Best Buy: Will match local retailer prices — including warehouse clubs like Costco and Sam's Club, as long as they're local — as well as online TV retailer prices Amazon, Newegg and TigerDirect. Fry's Electronics: Will match local retailer prices as well as "delivered" prices for select online retailers — meaning online price plus shipping charges. If you find a lower price within 30 days of purchase, Fry's will refund you 110% of the price difference. Newegg: Will match prices from Amazon, Best Buy, Costco, Fry's, Kmart, Sam's Club, Sears, Target, TigerDirect and Walmart within 14 days of purchase. Even if there's a lower price when you buy, you'll have to buy at Newegg's price and then submit a price match request, which will reimburse you in the form of a gift card. Sears: Will match all local retailer prices. Target: Will price match Amazon, Best Buy, Costco, Newegg, Sam's Club, Sears, and Walmart. Target will also match lower prices within 14 days after purchase. Walmart: Will match prices from Amazon, Best Buy, Kmart, Newegg, Sears and Target. Typically to get a retailer to price match, you'll just have to talk to an associate—or, for online retailers, email customer service—and provide proof of the lower price. Retailers only price match identical items and typically exclude items that are out of stock at the competing store. "Doorbuster" deals, as often found on Thanksgiving and Black Friday, are also typically excluded. And keep in mind that some retailers have exclusive models, so while you may find a very similar product, it won't have the same model number. Winner: Tie. While you'll usually find better prices online, aggressive price matching policies by brick and mortar stores mean you'll often be able to get online prices at a local store. Which has the best selection? Without any need to display items on store shelves, online retailers win big here: they can offer an almost endless selection. You can find practically any TV you want online, just a click away—which makes online retailers like Amazon a great place to browse and buy. But do you really need the option of every brand, size, resolution and refresh rate? Chances are you don't—and major brick and mortar retailers will have enough selection to make you happy. Winner: Online. But do you really need an endless selection of television options? Maybe not. You don't have to get in your car or even get out of your pajamas to shop online—it really doesn't get any more convenient than that. The lack of store employees could be a positive or a negative depending on how you look at it. If you're the type who likes to browse without being hassled, you'll definitely prefer the online experience. However, if you prefer to have someone around so you can ask questions, you might enjoy shopping in a store better—just be aware that not all store employees are experts on TVs and some will try to sell you on pricey accessories and warranties. Winner: It depends on your personal shopping preferences, but we'd say online. Which makes it easier to pick the right TV? You might think that going to a store to look at TVs in person is the best way to buy... but you'd be wrong. The TVs at the average retailer are poorly calibrated and displayed in lighting conditions that aren't similar to your home's. Plus, while you're browsing you're likely to be standing far closer to the screen than you would at home. The end result? TVs can look very different in the store than in your living room. In the end, you'll want to rely on online reviews to help you decide on the best set—and you can do that whether you shop online or in person. Which offers the best shipping options? If you buy from a brick and mortar store, you can usually load the TV in your car and bring it home immediately. But if your new TV won't fit into your compact car, you'll have to arrange for delivery even if you did buy it at a local retailer. Delivery can be free or it can cost you, so be sure to ask before you buy. Shipping options for online stores also vary. Amazon offers free shipping for large purchases like TVs, but other online retailers may charge a premium for delivery. However it's delivered, it will likely be left on your doorstep: you'll have to carry it in the house on your own—which can be a real hassle for larger sets. But we only said likely: for certain large items (including select TVs), Amazon offers "enhanced shipping" which means the TV will be carried into your home, unpacked in the room of your choice, and even set up on a stand—though Amazon won't mount a TV on the wall or hook up your Blu-ray player. No matter how you buy, check your shipping options and costs before you check out, as they can add—or eliminate—a lot of hassle. Winner: Brick and mortar, though Amazon's enhanced delivery is great... if it's available for the TV you want. Which offers the easiest setup? Admittedly, TV setup doesn't usually involve more than plugging it into the power outlet, cable box, and Blu-ray player—if you're replacing an existing HDTV, you'll already have the cables in place and won't need to do more than plug the right cables into the right slots on your new television. But some television stands or wall-mounts have IKEA-level complexity in their instructions. 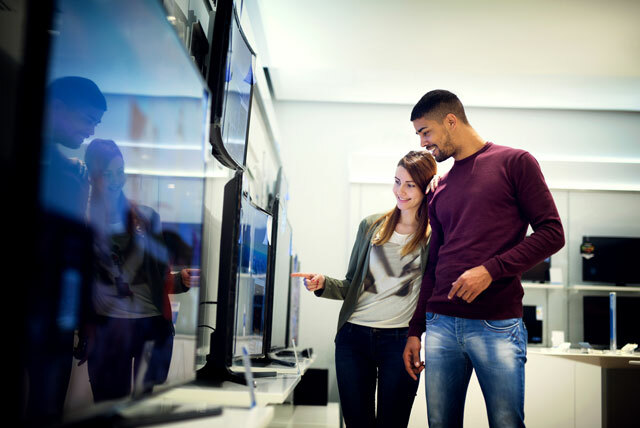 If that doesn't sound like something you're interested in figuring out, then getting someone to install your television is the easiest route—and for that, brick and mortar stores win out. Best Buy's Geek Squad will deliver your TV, bring it into the house (including up the stairs), and set it up exactly the way you want it—including getting it perfectly calibrated and setting up any accessories (prices start at $149.99). If you want no-hassle service, brick and mortar stores are the way to go. Still, online retailers are starting to get in on the installation business, too. Beyond Amazon's enhanced delivery service, Amazon offers TV installation through third parties—each vetted by Amazon and backed by the company's "happiness guarantee." We'd say you should be wary of retailers—in-store or online—that do installations through third parties, simply because those third parties may not be as reputable as the retailer itself. Be sure to do your homework on a third-party installer before signing up—Amazon's installers have customer reviews that can help. Winner: Brick and mortar, though Amazon's installation offerings keep improving. Which offers the easiest returns? Because it's so difficult to know what a television will be like until you look at it in your own living room, often the best way to pick the ideal model is to buy it, take it home, and see how it looks. If it doesn't look right in your living room, take it back and get another model. But, unfortunately, not all retailers make returns easy. Online retailers often make you pay shipping fees and even local brick and mortar retailers may have pricey "restocking" fees for returned electronics. Amazon: Return within 30 days. If the item came with enhanced delivery, a carrier will arrive to pack it and take it away. If it came without enhanced delivery, it must be unopened to be eligible for return. Best Buy: Return within 15 days. Costco: Return within 90 days. Fry's Electronics: Return within 30 days. Sears: Return within 30 days. Target: Unopened items may be returned within 90 days. Items that are opened may be denied return or exchange. Walmart: Return within 90 days. For any returns or exchanges, items will need to be in like-new condition, in their original box and with all accessories—and, of course, you'll need your original receipt. On top of that, most stores can deny returns for any reason—most typically when the item shows signs of use, to prevent you from picking up a big-screen TV to watch the Super Bowl and returning it the next day. For online purchases, you may have to pay for shipping to send it back—check with your retailer for details. Winner: Brick and mortar due to how easy it is to take a TV back to the store. However, Amazon's enhanced delivery is even easier if you're looking at a TV with that option. Which offers the best repair options? While Best Buy's Geek Squad offers a good way to get local technical help, if your television is broken it's typically the manufacturer (or, if you have a warranty, the warranty provider) that does the repairs. Major brands will have convenient repair options nationwide, no matter where you bought your television—so don't let Geek Squad service be the determining factor. For the best combination of price, selection, return policy and installation options, we like Amazon with enhanced delivery. But if you need to put eyeballs on your next set before you buy, it's good to know that there are benefits to shopping in store as well. Ready to buy a new TV? Check out picks for the best TVs under $500 and the best TVs under $1,000. A very nice buying info about television is shared here. I would suggest you must buy a swivel and tilt mount with your television. Because it will give you pleasure while watching television from any angle. It also prevents you from back and neck pain. for more details about “RD Mounts The Best Corner TV Stand” you can visit rdplast.in or contact to our mounting experts.